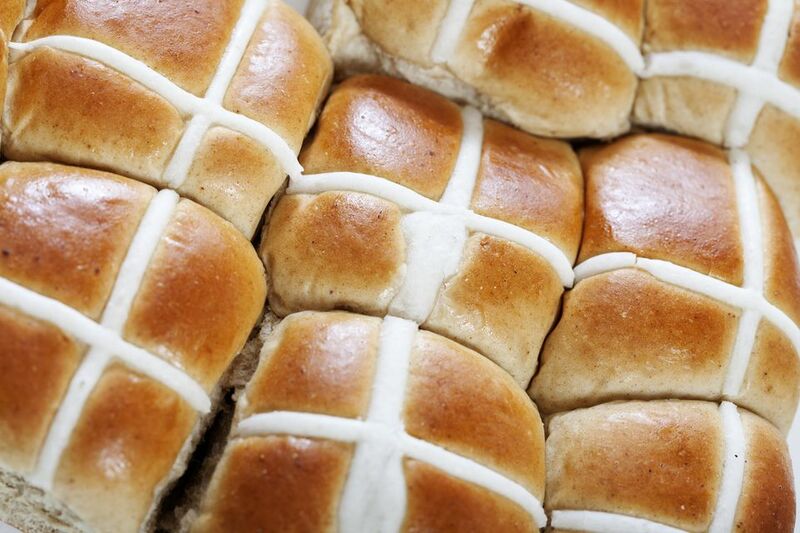 Hot cross buns have a long history as sweet breads made for offerings to ancient deities. As religions evolved and changed, Christians adopted hot cross buns as a special bread to be made and eaten every year on Good Friday. This basic hot cross bun recipe makes a sweet dough that can be divided into 9 large rolls or 12 smaller rolls. Each roll is topped with a deliciously sweet icing, making it a special treat for anyone with a sweet tooth. In a large bowl, stir in the evaporated milk and melted butter. Add the sugar, salt, and yeast. Stir until the sugar is dissolved. Mix in beaten egg, cinnamon, and nutmeg. Slowly mix in flour, one cup at a time, until a soft dough is formed. Put dough into a greased bowl and turn dough over so that the top is greased. Cover and let rise in warm place for 1 hour. Turn out dough and knead out air bubbles. Divide dough into 9 large rolls or 12 small rolls. Shape into rolls and place on greased baking sheet or cookie sheet. Cover and let rise for 30 to 45 minutes or until double in size. Slash an "X" on each bun top (optional). Bake at 350 F for about 45 minutes or until done. Remove from oven and allow to cool to warm. Mix icing ingredients into small bowl. Make a cross on top of buns with icing. There is a milk to dry milk powder conversion table. You can use it to figure out how much dry milk to add to the water if you decide to replace the milk in the recipe. You can omit the egg in this recipe and replace it with 1/4 cup water. Egg substitute can be used in place of the egg. You can use any type of milk in this recipe: whole milk, skim, low fat, etc. Evaporated milk can also be replaced with water and nonfat dry milk.